This part of the book contains practical examples of OmniThreadLibrary usage. Each of them starts with a question that introduces the problem and continues with the discussion of the solution. Scanning folders and files in a background thread. Multiple workers downloading data and storing it in a single database. Redirecting output from a parallel for loop into a structure that doesn’t support multi-threaded access. Using taskIndex property and task initializer delegate to provide a per-task data storage in Parallel for. Multiple workers generating data and writing it into a single file. Using OmniThreadLibrary to create a pool of database connections. How to sort an array and how to process an array using multiple threads. Finding data in a tree. Graphical user interface containing multiple frames where each frame is working as a front end for a background task. Using OmniThreadLibrary’s TOmniMessageQueue to communicate with a TThread worker. I’m looking into a way to do a longer operation (e.g. searching files on a drive) inside a thread to keep the main application responsive. With Delphi’s TThread I would override the Execute method. But that’s not good enough as the normal user would like to see a progress bar. It would also be great if the user could abort the search. This solution uses low-level part of the OmniThreadLibrary to implement a file scanner application. It is also available as a demo application 23_BackgroundFilesearch. The user interface is intentionally simple. User enters a path and file mask in the edit field and clicks Scan. The application starts a background task which scans the file system and reports found files back to the application where they are displayed in the listbox. During the scanning, main thread stays responsive. You can move the program around, resize it, minimize, maximize and so on. Besides the components visible at runtime, the form contains two components – a TOmniEventMonitor named OTLMonitor and a TTimer called tmrDisplayStatus. ScanFolders is the method that will do the scanning (in a background thread). Task will be monitored with the OTLMonitor component which will receive task messages. OTLMonitor will also tell us when the task has terminated. Input folder and mask are sent to the task as a parameter FolderMask and task is started. Let’s ignore the scanner details for the moment and skip to the end of the scanning process. When the task has completed its job, OTLMonitor.OnTaskTerminated is called. At that point, the number of found files is copied to the outFiles edit field and the complete list is assigned to the listbox. Task reference FScanTask is then cleared, which causes the task object to be destroyed and Scan button is re-enabled (it was disabled during the scanning process). We should also handle the possibility of user closing the program by clicking the ‘X’ button while the background scanner is active. We must catch the OnFormCloseQuery event and tell the task to terminate. Let’s move to the scanning part now. The ScanFolders method (which is the main task method, the one we passed to the CreateTask) splits the value of the FolderMask parameter into the folder and mask parts and passes them to the main worker method ScanFolder. ScanFolder first finds all subfolders of the selected folder and calls itself recursively for each subfolder. Because of that, we’ll first process deepest folders and then proceed to the top of the folder tree. Then it sends a message MSG_SCAN_FOLDER to the main thread. As a parameter of this message it sends the name of the folder being processed. There’s nothing magical about this message – it is just an arbitrary numeric constant from range 0..65534 (number 65535 is reserved for internal OmniThreadLibrary use). ScanFolder then runs the FindFirst/FindNext/FindClose loop for the second time to search for files in the folder. [BTW, if you want to first scan folders nearer to the root, just exchange the two loops and scan for files first and for folders second.] Each file is added to an internal TStringList object which was created just a moment before. When a folder scan is completed, this object is sent to the main thread as a parameter of the MSG_FOLDER_FILES message. Both Find loops test the state of the task.Terminated function and exit immediately if it is True. That allows us to terminate the background task when the user closes the application and the OnFormCloseQuery is called. That’s all that has to be done in the background task but we still have to process the messages in the main thread. For that, we have to implement the OTLMonitor’s OnTaskMessage event. Why don’t we directly update two edit fields on the form (one containing the current folder and another the number of found files)? The background task can send many messages in one second (when processing folders with a few files) and there’s no point in displaying them all – the user will never see what was displayed, anyway. It would also slow down the GUI because Windows controls would be updated hundreds of times per second, which is never a good idea. Instead of that we store the strings to be displayed in two form fields and display them from a timer which is triggered three times per second. That will not show all scanned folders and all intermediate file count results, but will still provide the user with the sufficient feedback. I need to download a list of web pages, extract data from them and then store this data in a SQLite database. The downloading/extracting part will happen in multiple threads (I’m using Synapse), but querying the database needs to be done asynchronously as I can only have one concurrent access to it. The simplest approach is to create a Pipeline with two stages – multiple http retrievers in the first stage and one database writer in the second stage. The number of concurrent http retrievers would have to be determined with some testing. It will depend on the throughput of the internet connection and on the quantity of the post-processing done on the retrieved pages. First pipeline stage, Retriever, fetches contents of one page. If the page is fetched correctly, a page description object (not shown in this demo) is created and sent to the output pipeline. Internally (not shown in this demo), TPage.Create could parse the page and extract the data. As there can be at most one output generated for each input, this stage is implemented as a simple stage meaning that the Pipeline itself will loop over the input data and call the Retriever for each input. Second stage, Inserter, is implemented as a normal stage (so it has to loop internally over all input data). First it establishes a connection to the database, then it loops over all input values (over data from all successfully retrieved pages) and inserts each result into the database. At the end (when there is no more data to process) it closes the database connection. Main method (ParallelWebRetriever) first sets up and starts the pipeline. Next it feeds URLs to be retrieved into the input pipeline and marks the input pipeline as completed. At the end it waits for the pipeline to complete. OmniThreadLibrary sets up tasks for the pipeline; there will be twice as many first-stage tasks as there are cores accessible from the process (this value was determined by guessing and would probably have to be adjusted in the real application) and only one task running the second stage. ParallelWebRetriever starts inserting URLs into the pipeline’s input queue. First-stage tasks immediately start processing these URLs and retrieving data from the web. At some moment, ParallelWebRetriever will run out of URLs and mark pipeline’s input as completed. One by one, first-stage tasks will finish processing the data. Each will send the data to the second stage over the pipeline and fetch new URL from the input queue. Second stage will read processed data item by item and write each item into the database. If it runs out of data to store (maybe the internet is slow today) it will wait for the next data item to appear in the pipeline. When a first-stage task finishes a job and there’s no more data in the pipeline’s input queue, it will immediately exit because the pipeline’s input is marked completed. After all first-stage tasks exit (because of lack of the input data), Pipeline will detect this and mark the queue leading to the second stage as completed. After that, second stage will process all remaining items in its input queue and then exit. This will shut down the pipeline and WaitFor call will exit. I’m using the Parallel.ForEach method for parsing a file. The items in the file are bank statements with corresponding transactions. I want to parse all the bank statements and add the resulting data to a general TList<T> containing all the parsed data. I know that adding a T to a TList<T> is the problem but I have no idea how to solve it. The best way is to use built-in capabilities of the For Each abstraction which allows you to write data to a shared blocking collection. Your program could then read data from this blocking collection and repack it to a TList<T>. A solution to this problem is included with the OmniThreadLibrary distribution in the examples/forEach output folder. The code first creates a blocking collection that will ‘pipe out’ data from the For Each abstraction. Next it starts a parallel for loop. It will iterate over all elements in the input list (ForEach), will preserve the order of the original items (PreserveOrder) and will write output into the blocking collection (Into). It will also run in background without waiting for all input to be processed (NoWait) so that the code in the main thread (for transaction in) can continue executing in parallel with the ForEach. The parallel for worker code just creates a TTransaction object from the input line and stores it in the result variable. ForEach code will take this result and store it in the outQueue. If you don’t want to produce a result for the given input value, just don’t set the result variable. This code also solves the stopping problem. The for transaction in loop will run until all the input is processed. Only when the ForEach is truly finished, the for transaction in will exit, ProcessTransaction will also exit and the object running the parallel for loop will be automatically destroyed. Below is the full code for a test program, implemented in a single form with a single component – ListBox1. I want to process some data in an array and generate aggregation result. For performance reasons I would like intermediate results for each worker to be stored in a separate part of memory and I want to merge those partial results at the end. Can this be achieved by using Parallel.For? This can be done by using the Parallel for taskIndex parameter. The example below also demonstrates the use of a task initializer which is strictly speaking not necessary in this case. A solution to this problem is included with the OmniThreadLibrary distribution in the examples/stringlist parser folder. The code below counts how many numbers in a big array of randomly generated data end in 0, 1, … 9 and reports this result at the end. Each worker generates a partial result for a part of input array and results are merged at the end. This example is included with the OmniThreadLibrary distribution in demo 57_For. Let’s assume we have a big array of test data (testData: array of integer). We can easily generate this data with a call to Parallel.For. This data is not very random (but is still random enough for the purpose of this demo). The Parallel data production example shows a better way to generate random numbers in multiple worker threads. As we have to prepare data storage for each worker thread, we have to know how many worker threads will be running. Therefore, we have to set the number of workers by calling NumTasks. A good default for a CPU intensive operation we’ll be executing is to create one worker task for each available core. Each buckets element will store data for one worker thread. Next, the .Execute is called and provided with a delegate which accepts two parameters – the task index taskIndex and the current value of the for loop idx. The code determines the last digit of the testData[idx] and increments the appropriate slot in the bucket that belongs to the current task. At the end, partial data is aggregated in the main thread. Result is stored in buckets. Output is a TStringList containing characters (on per TStringList item) of the input string. A background thread (master) grabs the input string and splits it into several pieces. For each piece it creates a new thread (child). Child thread receives its piece, splits it into characters and returns the result to the master thread. Main thread is sending workloads (strings) to the master thread. At any time the master thread could be signalled to terminate all child threads and itself. When everything is done, the application’s main thread processes the string list. Preferably the order of the characters should be the same as their original order. Master thread splits it into two parts - 'del' and 'phi'. Master thread starts two child threads. First receives input 'del' and second input 'phi'. First child thread splits 'del' into three strings - 'd', 'e', 'l' - and returns them to the master thread. Second child thread splits 'phi' into three strings - 'p', 'h', 'i' - and returns them to the master thread. Master thread returns a TStringList containing strings 'd', 'e', 'l', 'p', 'h' and 'i' to the main thread. You should keep in mind that this is really just a simplified example because there is no sense in splitting short strings into characters in multiple threads. A solution to this problem is included with the OmniThreadLibrary distribution in the examples/stringlist parser folder. Background worker accepts multiple work requests and pairs results with requests. The original question didn’t specify whether the master should accept more than one request at the same time but I decided to stay on the safe side and allow this. Background worker supports work request cancellation. The child tasks are implemented as a Paralel task abstraction. It allows us to run a code in multiple parallel tasks at the same time. Tearing it down is also simple. CancellAll is called to cancel any pending work requests, Terminate stops the worker (and waits for it to complete execution) and assignment clears the interface variable and destroys last pieces of the worker. The BreakStringHL method takes a work item (which will contain the input string), sets up a parallel task abstraction, splits the input string into multiple strings and sends each one to the parallel task. BreakStringHL is called for each input string that arrives over the communication channel. It firstly decides how many threads to use (number of cores minus one; the assumption here is that one core is used to run the main thread). One string list is then created for each child subtask. It will contain the results generated from that task. A Parallel task abstraction is then started, running (number of cores minus one) tasks. Each will accept a work unit on an internally created queue, process it and shut down. Next, the code sends work units to child tasks. Each work unit contains the index of the task (so the code knows where to store the data) and the string to be processed. All child tasks also get the same cancellation token so that they can be cancelled in one go. Child tasks are executed in a thread pool to minimize thread creation overhead. When all child tasks are completed, partial results are collected into one TStringList object which is returned as a result of the background worker work item. Actual string breaking is implemented as a standalone procedure. It checks each input character and signals the cancelation token if the character is an exclamation mark. (This is implemented just as a cancelation testing mechanism.) It exits if the cancelation token is signalled. At the end, Sleep(100) simulates heavy processing and allows the user to click the Cancel button in the GUI before the operation is completed. The example program uses simple OnClick handler to send string to processing. Results are returned to the ShowResultHL method (as it was passed as a parameter to the OnRequestDone call when creating the background worker). It receives an IOmniBackgroundWorker interface (useful if you are sharing one method between several background workers) and the work item that was processed (or cancelled). The code simply checks if the work item was cancelled and displays the result (by using the ShowResult from the original code) otherwise. The demonstration program also implements a Cancel button which cancels all pending operations. All not-yet-executing operations will be cancelled automatically. For the string that is currently being processed, a cancellation token will be signalled. SplitPartialList will notice this token being signalled and will stop processing. This question comes from StackOverflow. It is reproduced here in a slightly shortened form. I am looking into generating a file (750 MB) full of random bytes. The problem is that it takes ages until the process completes. Any ideas for a faster approach? This solution uses Parallel Task abstraction. The tricky part is implementing the third item – ‘find out how many bytes to process in this iteration’ – in a lock-free fashion. What we need is a thread-safe equivalent of the following (completely thread-unsafe) fragment. OmniThreadLibrary implements a thread-safe version of this pattern in TOmniCounter.Take. If you have TOmniCounter initialized with some value (say, fileSize) and you call TOmniCounter.Take(numBytes), the code will behave exactly the same as the fragment above except that it will work correctly if Take is called from multiple threads at the same time. In addition to that, the new value of the fileSize will be stored in the TOmniCounter’s counter and returned as a function result. There’s another version of Take which returns the result in a var parameter and sets its result to True if value returned is larger than zero. This version of Take allows you to write elegant iteration code which also works when multiple tasks are accessing the same counter instance. The solution creates a counter which holds the number of bytes to be generated (unwritten) and a queue (outQueue) that will hold generated data buffers until they are written to a file. Then it starts a ParallelTask abstraction on all available cores. While the abstraction is running in the background (because NoWait is used), the main thread continues with the CreateRandomFile execution, reads the data from the outQueue and writes blocks to the file. The parallel part firstly creates a random generator in each task. Because the random generator code is not thread-safe, it cannot be shared between the tasks. Next it uses the above-mentioned Take pattern to grab a bunch of work, generates that much random data (inside the FillBuffer which is not shown here) and adds the buffer to the outQueue. You may be asking yourself how will this code stop? When the unwritten counter drops to zero, Take will fail in every task and anonymous method running inside the task will exit. When this happens in all tasks, OnStop handler will be called automatically. The code above passes Parallel.CompleteQueue to the OnStop. This is a special helper which creates a delegate that calls CompleteAdding on its parameter. Therefore, OnStop handler will call outQueue.CompleteAdding, which will cause the for loop in CreateRandomFile to exit after all data is processed. Is it possible to use OTL to create Connection Pool systems? It seems like OTL solves a lot of the concurrency and communications issues. Is this feasible? The thread pool enables connection pooling by providing property ThreadData: IOtlThreadData to each task. This property is bound to a thread – it is created when a thread is created and is destroyed together with the thread. To facilitate this, task implements property ThreadData which contains the user data associated with the thread. This data is initialized in the thread pool when a new thread is created. It is destroyed automatically when a thread is destroyed. To initialize the ThreadData, write a ‘factory’ method, a method that creates a thread data interface. The thread pool will call this factory method to create the thread data and will then assign the same object to all tasks running in that thread. You can write two kinds of a thread data factories – a ‘normal’ function that returns an IInterface or a method function (a function that belongs to a class) that returns an IInterface. Let’s return to the practical part. In the database connection pool scenario, you’d have to write a connection interface, object and factory (see demo application 24_ConnectionPool for the full code). In the OnCreate event the code creates a thread pool, assigns it a name and thread data factory. The latter is a function that will create and initialize new connection for each new thread. In the OnClose event the code terminates all waiting tasks (if any), allowing the application to shut down gracefully. FConnectionPool is an interface and its lifetime is managed automatically so we don’t have to do anything explicit with it. Thread data factory could also be assigned to the global thread pool by calling GlobalOmniThreadPool.SetThreadDataFactory. There’s no black magic behind this connection object. It is an object that implements an interface. Any interface. This interface will be used only in your code. In this demo, TConnectionPoolData contains only one field – unique ID, which will help us follow the program execution. As this is not a code from a real world application, I didn’t bother connecting it to any specific database. TConnectionPoolData constructor will just notify the main form it has begun its job, generate a new ID and sleep for five seconds (to emulate establishing a slow connection). The destructor is even simpler, it just sends a notification to the main form. Creating and running a task is simple with the OmniThreadLibrary. We are monitoring the task with the TOmniEventMonitor component because a) we want to know when the task will terminate and b) otherwise we would have to store into a global field a reference to the IOmniTaskControl interface returned from the CreateTask. The task worker procedure TaskProc is again simple. 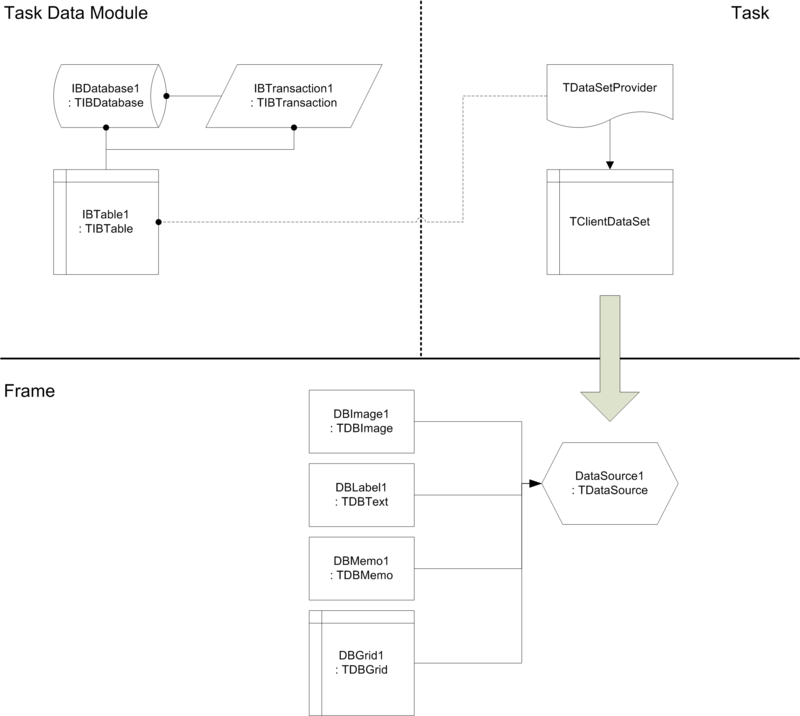 First it pulls the connection data from the task interface (task.ThreadData as IConnectionPoolData), retrieves the connection ID and sends task and connection ID to the main form (for logging) and then it sleeps for three seconds, simulating heavy database activity. There is also a code assigned to the second button (Schedule and wait) but it only shows how you can schedule a task and wait on its execution. This is useful if you’re running the task from a background thread. It was immediately scheduled for execution and thread pool called our thread data factory. Thread data object constructor waited for five seconds and returned. If you now let the program run for 10 seconds, a message ‘Destroying connection 1’ will appear. The reason for this is that the default thread idle timeout in a thread pool is 10 seconds. In other words, if a thread does nothing for 10 seconds, it will be stopped. You are, of course, free to set this value to any number or even to 0, which would disable the idle thread termination mechanism. If you now click the Schedule button again, a new thread will be created in the thread pool and a new connection will be created in our factory function (spending 5 seconds doing nothing). To recap – when running the demo, the thread pool was limited to two concurrent threads. When I clicked the Schedule button two times in a quick succession, the first task was scheduled and the first connection started being established (has entered the Sleep function). Then the second task was created (as the connection is being established from the worker thread, GUI is not blocked) and the second connection started being established in the second thread. Five seconds later, connections are created and tasks start running (and wait three seconds, and exit). Then I clicked the Schedule button two more times. Two tasks were scheduled, and they immediately started execution in two worker threads. For the third demo, I restarted the app and clicked the Schedule button three times. Only two worker threads were created and two connections established and two tasks started execution. The third task entered the thread pool queue and waited for the first task to terminate, after which it was immediately scheduled. So here you have it – a very simple way to build a connection pool. I would like to sort a big array of data, but my comparison function is quite convoluted and sorting takes a long time. Can I use OmniThreadLibrary to speed up sorting? On a similar topic – sometimes I’d also like to find a maximum data element in this big array, without doing the sorting. How would I approach this problem? The answer to both parts of the problem is the same – use the Fork/Join abstraction. The first part of this how-to implements a well-known quicksort algorithm in a parallel way (see demo application 44_Fork-Join QuickSort for the full code). Let’s start with a non-optimized single-threaded sorter. This simple implementation is easy to convert to the multi-threaded form. As you can see, the code switches to an insertion sort when the dimension of the array drops below some threshold. This is not important for the single-threaded version (it only brings a small speedup) but it will help immensely with the multi-threaded version. Converting this quicksort to a multi-threaded version is simple. Firstly, we have to create a Fork/Join computation pool. In this example, it is stored in a global field. Secondly, we have to adapt the QuickSort method. … and the code Awaits on both subtasks. Instead of calling QuickSort directly, parallel version creates IOmniCompute interface by calling FForkJoin.Compute. This creates a subtask wrapping the anonymous function which was passed to the Compute and puts this subtask into the Fork/Join computation pool. The subtask is later read from this pool by one of the Fork/Join workers and is processed in the background thread. Calling Await checks if the subtask has finished its work. In that case, Await returns and the code can proceed. Otherwise (subtask is still working), Await tries to get one subtask from the computation pool, executes it, and then repeats from the beginning (by checking if the subtask has finished its work). This way, all threads are always busy either with executing their own code or a subtask from the computation pool. Because two IOmniCompute interfaces are stored on the stack in each QuickSort call, this code uses more stack space than the single-threaded version. That is the main reason the parallel execution is stopped at some level and simple sequential version is used to sort remaining fields. The second part of this how-to finds a maximum element of an array in a parallel way (see demo application 45_Fork-Join max for the full code). The parallel solution is similar to the quicksort example above with few important differences related to the fact that the code must return a value (the quicksort code merely sorted the array returning nothing). This directly affects the interface usage – instead of working with IOmniForkJoin and IOmniCompute the code uses IOmniForkJoin<T> and IOmniCompute<T>. As our example array contains integers, the parallel code creates IOmniForkJoin<integer> and passes it to the ParallelMax function. In this example Fork/Join computation pool is passed as a parameter. This approach is more flexible but is also slightly slower and – more importantly – uses more stack space. When the array subrange is small enough, ParallelMax calls the sequential (single threaded) version – just as the parallel QuickSort did, and because of the same reason – not to run out of stack space. With a big subrange, the code creates two IOmniCompute<integer> subtasks each wrapping a function returning an integer. This function calls back ParallelMax (but with a smaller range). To get the result of the anonymous function wrapped by the Compute, the code calls the Value function. Just as with the Await, Value either returns a result (if it was already computed) or executes other Fork/Join subtasks from the computation pool. While creating Fork/Join programs, keep in mind this anti-pattern. The following code fragment is wrong! You must always create all subtasks before calling Await or Value! Otherwise, your code will not execute in parallel at all – it will all be processed by a single thread. My program often searches for data in a large tree structure. The comparison function is pretty convoluted, and the search takes a lot of time. Could it be sped up by using parallelization? The For Each abstraction can be used to iterate over complicated structures such as trees. The biggest problem is to assure that the code will always stop. The solution below achieves this by using special features of the blocking collection. The solution to this problem is available as a demo application 35_ParallelFor. The code in the demo application creates a big tree of TNode nodes. Each node contains a value (Value) and a list of child nodes (Child). TNode also implements a function to return the number of children (NumChild), a function that converts the node into a textual representation (ToString; used for printing out the result) and an enumerator that will allow us to access child nodes in a nice structured fashion (Children). To learn more about the implementation of TNode and its enumerator, see the demo program. 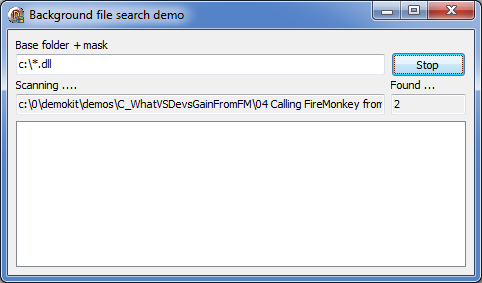 For comparison the demo program implements sequential search function SeqScan which uses recursion to traverse the tree. The code first creates a cancellation token which will be used to stop the ForEach loop. Number of tasks is set to number of cores accessible from the process and a blocking collection is created. Resource count for this collection is initialized to the number of tasks (numTasks parameter to the TOmniBlockingCollection.Create). This assures that the blocking collection will be automatically put into the ‘completed’ mode (as if the CompleteAdding had been called) if numTasks threads are simultaneously calling Take and the collection is empty. This prevents the ‘resource exhaustion’ scenario – if all workers are waiting for new data and the collection is empty, then there’s no way for new data to appear and the waiting is stopped by putting the collection into completed state. The root node of the tree is added to the blocking collection. Then the Parallel.ForEach is called, enumerating the blocking collection. The code is provided with one element from the blocking collection at a time. If the Value field is the value we’re searching for, nodeResult is set, blocking collection is put into CompleteAdding state (so that enumerators in other tasks will terminate blocking wait (if any)) and cancellation token is signalled to stop other tasks that are not blocked. Otherwise (not the value we’re looking for), all the children of the current node are added to the blocking collection. TryAdd is used (and its return value ignored) because another thread may call CompleteAdding while the for childNode loop is being executed. Parallel for loop is therefore iterating over a blocking collection into which nodes are put (via the for childNode loop) and from which they are removed (via the ForEach implementation). If child nodes are not provided fast enough, blocking collection will block on Take and one or more tasks may sleep for some time until new values appear. Only when the value is found, the blocking collection and ForEach loop are completed/cancelled. I am running multiple background tasks implemented with OmniThreadLibrary’s CreateTask function and they are all interacting with the same form in the program. I want to separate user interface into separate frames, each interacting with one task but I can’t find a good way to do it. The solution to this problem can be split into three parts – the worker, the frame and the binding code in the form unit. The solution to this problem is available as a demo application 49_FramedWorkers. In this example (unit test_49_Worker in the demo application), the worker code is intentionally simple. It implements a timer which, triggered approximately every second, sends a message to the owner. This message is received in a Msg parameter when the task is created. The worker can also respond to a MSG_HELLO message with a 'Hello' response. Message ID’s (MSG_HELLO, MSG_NOTIFY) are defined in unit test_49_Common as they are shared with the frame implementation. The frame (unit test_49_FrameWithWorker) contains a listbox and a button. It implements a response function for the MSG_NOTIFY message – MsgNotify – and it contains a reference to the worker task. This reference will be set in the main form when the task and the frame are constructed. The MsgNotify method is automatically called whenever the MSG_NOTIFY message is received by the frame. It merely shows the message contents. A click on the button sends a MSG_HELLO message to the worker. A name of the frame is sent as a parameter. The worker will include this name in the response so we can verify that the response is indeed sent to the correct frame. Five frame/worker pairs are created in the form while it is being created. The code in FormCreate creates and positions each frame and then creates a worker named Frame #%d (where %d is replaced with the sequential number of the frame). Workers are created in the CreateWorker method. The FormCreate method also creates a task group which is used to terminate all workers when a form is closed. The final piece of the puzzle is the CreateWorker method. It creates a low-level task and sets its name. The same name is assigned to the Msg parameter so that it will be used in messages sent from the task. The OnMessage call assigns the frame to function as a ‘message-processor’ for the tasks – all messages from the task will be dispatched to the frame. That’s how the MSG_NOTIFY message ends up being processed by the frame’s MsgNotify method. The code above also assigns the worker to the frame and adds the worker to the task group. For a different approach to multiple workers problem see OmniThreadLibrary and databases. Can you tell me how to use databases in combination with OmniThreadLibrary? Using databases with the OmniThreadLibrary can be quite simple at times; on the other hand, it can also be quite tricky. The main problem with databases is that you have to create database components in the thread that will be using them. As the visual components (as the TDBGrid) must be initialized from the main thread, this implies that you can’t directly connect database-aware GUI controls to database components. Because of that, you have to devise a mechanism that transfers database data from the task to the main thread (and also – if the database access is not read-only – a mechanism that will send updates to the task so they can be applied to the database). In most cases this means you should ignore database-aware components and just build the GUI without them. In some cases, however, you could do a lot with splitting the existing database infrastructure at the correct point and leaving the GUI part almost unmodified. This example explores such an option. An example is included with the OmniThreadLibrary distribution in the examples/twofish folder. 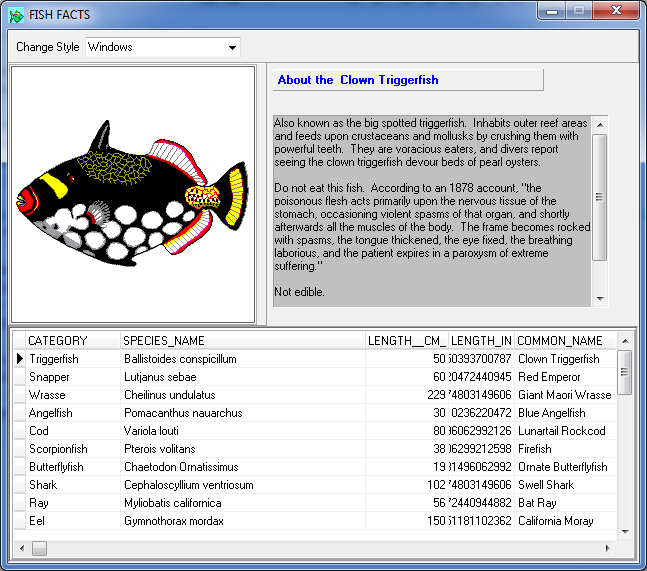 The basis for this article is the well-known Fish Facts demo program, included in Delphi’s Samples18 folder. This is a simple application that uses database-aware controls to display data from an InterBase database. I have built a view-only version of Fish Facts called TwoFish which uses two frames, each containing data-aware controls and a background thread which accesses the InterBase data. Both frames are running in parallel and accessing the data at the same time. To create the TwoFish, I have copied Fish Facts components IBDatabase1, IBTransaction1 and IBTable1 into a data module twoFishDB. This data module contains no code, only these three components. I have also set IBDatabase1.Connected and IBTable1.Active to False. Then I created the frame twoFishDB_GUI which uses the data module twoFishDB. This frame contains an unconnected TDataSource component DataSource1 and all data-aware components that are placed on the Fish Facts form – TDBGrid, TDBImage, TDBText and TDBMemo. They are all connected to the DataSource1. Main TwoFish program creates two frames. Each frame creates a Background Worker abstraction that (inside the worker task) creates the data module and activates database and database table (more details are given below). When data is to be retrieved, the task creates a TClientDataSet and a TDataSetProvider which ‘pumps’ all data from the IBTable1 to the TClientDataSet. This client data set is then sent to the main form which connects it to the DataSource1. This automatically causes the data to be displayed in the data-aware controls. To keep the example simple, I have disabled data editing. Data module is initialized from the task, not from the frame’s event handlers. This way it is initialized in the thread that uses it. Data module is destroyed before the OnDestroy is called (OnCloseQuery is used for this purpose). If you try to destroy the data module from the OnDestroy, a deadlock will occur inside the Delphi RTL code. This example shows a different approach to frame-task interaction than the Multiple workers with multiple frames – here the background worker is managed by the frame itself, not by the main form. The frame wraps one background task that operates on the database and contains database-aware controls displaying the database data. The Background Worker abstraction is created in the AfterConstruction method and destroyed in the BeforeDestruction method. AfterConstruction creates a background worker and specifies task initializer and finalizer (.Initialize and .Finalize). Delegates provided to these two functions (InitializeDatabase and FinalizeDatabase) are called when background worker task is created and before it is destroyed. You may have noticed that no code was provided to execute work items. The reason behind this is that the background worker will execute different types of requests. Instead of writing if ... then tests to detect the work item type and trigger appropriate code, we’ll pass the executor function together with each request. BeforeDestruction destroys the background worker and destroys the FDataSet component (we’ll see later why it is used). Task initializer and finalizer are also very simple – they just create and destroy the data module. The data module is accessible to the background worker through the taskState variable. Data controls are initially in an unconnected state. They are only connected when the public method OpenConnection is called. The important fact to note is that the OnExecute parameter (ConnectToDatabase) is called from the worker thread and the OnRequestDone parameter (the anonymous function) is called from the thread that created the frame (the main thread). The data module associated with the worker is accessed through the workItem.TaskState property which gives you access to the taskState variable initialized in the InitializeDatabase method. Database name is taken from the work item parameter (workItem.Data). The database name is set in the IBDatabase component and connection is established (Connected := true). If the connection fails, an exception will be raised. This exception is caught by the OmniThreadLibrary and stored in the workItem object where it is later processed by the anonymous method in the OpenConnection method. To retrieve data from the database, main unit calls the Reload function. This function is also called inside the frame from the click event on the Reload button. Reload just schedules a work request without any input. To process the request, LoadData will be called. LoadData executes in the background worker thread. It uses a temporary TDataSetProvider to copy data to a freshly created TClientDataSet20. During this process, a ‘Field not found’21 exception is raised twice. If you run the program in the debugger, you’ll see this exception four times (twice for each frame). You can safely ignore the exception as it is handled internally in the Delphi RTL and is not visible to the end-user. At the end, the TClientDataSet that was created inside the LoadData is assigned to the workItem.Result. It will be processed (and eventually destroyed) in the main thread. The DisplayData method executes in the main thread after the request was processed (i.e., the data was retrieved). If there was an exception inside the work item processing code (LoadData), it is displayed. Otherwise, the TClientDataSet is copied from the workItem.Result into an internal TfrmTwoFishDB_GUI field and assigned to the DataSource1.DataSet. By doing that, all data-aware controls on the frame can access the data. The main program is fairly simple. In the OnCreateEvent two frames are created. Frame references are stored in the FFrames form field, declared as array of TfrmTwoFishDB_GUI. Next, the form is resized to twice the frame size and OpenConnections is called to establish database connections in all frames. OpenConnections iterates over all frames and calls OpenConnection method in each one. Two parameters are passed to it – the database name and an anonymous method that will be executed after the connection has been established. If the connection fails, the FatalException field will contain the exception object raised inside the background worker’s OpenConnection code. In such a case, it will be logged. Otherwise, the connection was established successfully and Reload is called to load data into the frame. Frames are destroyed from OnCloseQuery. It turns out that Delphi (at least XE2) will deadlock if data modules are destroyed in background threads while OnDestroy is running. Always create non-visual database components in the thread that will be using them. Always create data-aware controls in the main thread. Never connect data-aware controls to non-visual database components that were created in a secondary thread. Wrap TIBDatabase.Connected := true in a critical section because of gds32 bugs. Destroy database tasks from OnCloseQuery, not from OnDestroy if you are using data modules in a secondary thread. Establish some mechanism of data passing between the database (secondary thread) and the view (main thread). Can you give me any tips on how to use COM services from background threads? It is actually very simple – you have to remember to call CoInitializeEx and CoUninitialize from the task code and then you won’t have any problems. I have put together a simple example that uses SOAP to retrieve VAT info for European companies using the SOAP service at ec.europa.eu. It is included with the OmniThreadLibrary distribution in the examples/checkVat folder. The program has two input fields, one for the country code (inpCC) and one for the VAT number (inpVat), a button that triggers the SOAP request (btnCheckVat) and a memo that displays the result (outVatInfo). 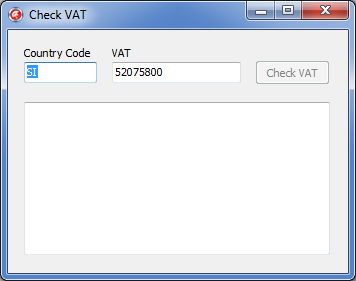 There’s only one method – the btnCheckVat.OnClick handler. This method firstly disables the button (so that only one request at a time can be active) and clears the output. Then it uses a Future returning a checkVatResponse (a type defined in the checkVatService unit which was generating by importing the WSDL specification). This Future will execute the SOAP request in a background task and after that the anonymous method in Parallel.TaskConfig.OnTerminated will be called in the main thread. This anonymous method displays the result in the outVatInfo control, destroys the FRequest Future object and enables the button. The main Future method looks just the same as if it would be executed from the main thread except that the SOAP stuff is wrapped in CoInitializeEx/CoUninitialize calls that make sure that everything is correctly initialized for COM/OLE. I’m not yet using OmniThreadLibrary for multi-threading, just normal TThread-based threads, but I would like to add OmniThreadLibrary’s messaging model to my threads. How can I use OmniThreadLibrary to send and receive data to/from a thread? The simplest way is to create two TOmniMessageQueue objects, one to send data to a thread and one to receive data. Alternatively, you could create a TOmniTwoWayChannel, which is just a simple pair of two TOmniMessageQueue instances. The solution below uses a former approach. A solution to this problem is included with the OmniThreadLibrary distribution in the examples/TThread communication folder. Sending data from any thread (main or background) to a TThread based worker. Sending data from any TThread based worker or from a form to the main thread (to a form). To send data form a form to a thread, we need a message queue. This example uses a TOmniMessageQueue object for that purpose. An instance of this object is created in the main thread. All threads – the main thread, the worker threads, and potential other data-producing threads – use the same shared object which is written with thread-safety in mind. The TOmniMessageQueue constructor takes a maximum queue size for a parameter. TWorker is just a simple TThread descendant which accepts the instance of the message queue as a parameter so it can read from the queue. The shutdown sequence is fairly standard. Stop is used instead of Terminate so it can set internal event which is used to signal the thread to stop. To put data into a queue, use its Enqueue method. It accepts a TOmniMessage record. Each TOmniMessage contains an integer message ID (not used in this example) and a TOmniValue data which, in turn, can hold any data type. The example below shows how everything works correctly if two threads are started (almost) at the same time and both write to the message queue. The worker’s Execute method waits on two handles in a loop. If a FStopEvent (an internal event) is signalled, the loop will exit. If the message queue’s GetNewMessageEvent (a THandle-returning method) gets signalled, a new data has arrived to the queue. In that case, the code loops to empty the message queue and then waits again for something to happen. It is not a good idea to just read one element from the queue when a handle is signalled and then wait until a handle is signalled again before reading the next element. If elements are added to the queue in a quick succession, the queue will slowly fill up and overflow. The proper way is to always read all data from the queue when a handle is signalled. To send messages from a worker thread to a form, we need another instance of TOmniMessageQueue. As we can’t wait on a handle in the main thread (that would block the user interface), we’ll use a different notification mechanism – a window message observer. We create the queue just as in the first part. To use a window message observer we then just have to assign a message handler to the queue’s OnMessage event. An observer will be set up automatically in the background. After that, the event handler will be called once for each message that is inserted into the queue from any thread (or from the form itself). While shutting down, we just have to destroy the queue. To send a data, we use exactly the same approach as in the first part (sending data to a worker). On the receiving side (the form) we have to write an event handler that is called for each message.